The 9,000-year-old remains of a mother and her baby discovered off the coast of Israel provide the earliest concrete evidence of human TB, say researchers. The bones were excavated from Alit-Yam, an ancient Neolithic village near Haifa, which has been submerged in the Mediterranean for thousands of years. The experts from University College London and Tel-Aviv University used DNA technology to confirm the bacterium. 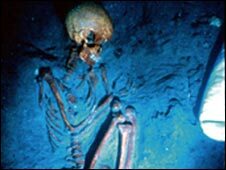 Others have found remains that hint at TB dating from about 500,000 years ago.